Last weekend I felt really stressed out. I felt like I had so much to do and not enough time to get everything done. I don’t get this way often, but on this particular day I felt overloaded with everything that was ahead of me in the next week. I stopped to read scripture, renew myself and I opened up a newsletter I had just received from Sid Roth’s Mishochah (May 2012). In it there was an article and prayer by Dr. Jim Richards, founder of Impact Ministries in Huntsville,Alabama. The prayer was interesting and I did question a few things I was unfamiliar with, but decided to pray the prayer. It seemed so simple and so short, but as soon as I had finished, a supernatural peace came over me. I had been instantly freed from this feeling of stress that had a hold of me. Not only was I calm, but I realized what was stressing me- which I didn’t know before. I just felt stressed, but didn’t know why. The article goes into detail of the prayer and I will condense it a bit below because the article is too long to write here. –and to make this even stranger- after I had prayed this prayer about 2-3x, I had a really interesting dream that I share below. Heavenly Father search my heart and discover the origin of this ( thought or feeling) of ____________________________. Go to the very root of my being and resolve this origin in order to bring every aspect of my spirit, soul, and body into harmony with your truth and my true identity in Christ. Search through every generation, every cellular memory, every action and every expression of this (thought/feeling) of______________________________. I choose to express my love for myself and my right as a child of God by allowing every mental, emotional, spiritual and physical dis-ease and inappropriate behavior based on this root problem recorded in my DNA to be transformed. It is done! It is finished; it is mine by the resurrection of Jesus! Thank you, Holy Spirit for the grace to live in the fullness of my identity as a child of God and a new creation in Christ. I give you thanks, Jehovah my Healer, Who is good and only good. You are my God, my strength, my hope and my salvation! Why do I want the Lord to discover the origin? Because I don’t know if this feeling of being overwhelmed is really about how much work I have to do. I don’t know if it’s because this situation reminds me of a negative experience from my past, I just want to give God permission to go to the very root of it. We’re not trying to get God to do something that hasn’t already been paid for. We’re briging this thought or feeling captive to the obedience of Messiah. Jesus has already paid for my deliverance from feeling overwhelmed. Jesus has already paid for me to have the power to accomplish things, to have peace and to have the mind of the Messiah. Why every generation? Because we have learned that through cellular memories we pick up traits from our relatives going back several generations. because I’ve probably done things that have contributed to this. ( and here’s the clincher) and forgive every person, place or circumstance that has contributed to this feeling of being overwhelmed. It is my right as a child of God to exercise this authority. And I have to love myself enough to do this. I want to transform every inappropriate aspect of how this has been expressed in my life, and I really want this thing rooted out in my DNA, rooted out of who I am. After you have prayed, express your personal love and appreciation to Him! (“The article continues on but ends with these words) Don’t let your past rob you of your future. Yesterday, early morning, I was waking up out of a very different dream. It seemed there had been an innumerable amount of time and hours spend searching through my entire life- and exhaustive study- you could say of me. Things were being taken out of my life- every bad thing I had ever done and said and every wrong or bad thing that had happened to me was being taken out of me and put in a canister that was being held. There was much- intense study- searching back to my early childhood. As I was waking up, yet still in dream, the exhaustive study of me was almost over. They were taking out all the times I had been hurt or hard times I had suffered- back to my toddler and childhood days. It was amazing. I looked at the canister and it was almost full and I turned to see myself. I could see myself standing up with my arms out as my life was searched and cleaned out. I looked- and in amazement I had turned this brilliant white light. My arms, my clothes. I could see myself on a brilliant white step and there I was brilliant shining white light. I was changed and transformed. I wonder if this is what will happen when the Lord changes us! It was amazing. Peace Everyone! Hey- I was reading in Ruth and noticed that every time they saw each other they greeted each other with a blessing. They didn’t say- hi, how are you. When they saw each other, they said “The Lord be with you”. I think we should do this! I noticed when Boaz came to his workers, he said “The Lord be with you” and they replied; “May the Lord bless you” My sister and I already started this, we love it! May the Lord bless you today! May His face shine upon You! The Lord is good and His mercy endures forever! Amen. We are fighting an invisible war – a fight for our souls. Wake up Sleeper! Get off the couch man of valor and soldier of the Lord- Pick up those weapons the Lord almighty has given you and speak out with the sword of God. Use the sword, the Word of God to knock down the destroyer of your soul. Speak out, pray God’s Promises and be set free. Oh Lord, why is that so difficult to believe? Why do my thoughts fight your word? The heart is desperately wicked above all. You must fix your thoughts on the truth and then you will find your way. Oh Lord, in you I rejoice! Bow down before me, for I am your God. Show respect and reverent fear before me. I love you. Tell them the Lord is King over all the Earth. Be more involved with your children’s’ lives and not your own. Speak good things and not bad. You are my shield and the lifter of my head. Oh my soul, why are you so downcast? Put your hope in God. I remember all your words and your great miracles. You answer my prayers and rescue me. I sing your praises and will give you thanks forever. In you, I have perfect peace. You have taught me to rejoice in trials- for they are good for me. I have seen you bend down from the heavens to hear me in the night. You have reminded me of your love for me even though it is too great to understand. You are a shield of protection around me. I saw my enemy before my face, yet I stood unshakeable because I trust in you. You comfort me in every trouble and spoke to me with truth. You remind me that it is you who I trust. You sent your word from heaven when you heard my cry. I saw it coming from far away. My trust shall be in you. When I am pressed on every side by troubles I am not crushed. When I am confused or perplexed, I don’t give up. You strengthen me and help me run even in my weakness. I am weak, but you are Strong. Your power works best in my weakness. Through you, I have strength for all things in Christ -who strengthens me. You are a righteous God, the Lord hears the cries of the broken-hearted. My hope is in you. I am content in any state I am in. Jesus pleads for me before the Mighty Lord. He is my high priest and in this I have confidence. I can boldly go before God’s throne in reverent fear- for He has made me sit in heavenly places and there I am before Him. I stand silent. You see my troubles and the anguish of my soul. I call out to you and you deliver me. You send your angels to protect me. You send orders from heaven to save me. Before you I wait in silence- my salvation is from you. You are my rock and my salvation. You are my defense, my fortress, my strong deliverer. Though trials and troubles surround me, I stand unshakable. Your Word revives me and gives me strength. You preserve me when troubles come. Blessed be the God and Father of our Lord Jesus Christ! and had nowhere to turn. the indescribable power of the Lord. I feel a great urgency in my spirit to pray for those in our families who are unsaved. Today is the day to set yourself to pray for those around you and never ever give up. Pray, pray, pray everyday for your unsaved family and the lost. Become a prayer warrior for the unsaved around you. Pray for your family, friends, your nation, the lost, those who are perishing and the missionaries around the world. Treat everyone with the Love of Jesus. In the heart of believers is a fire. This fire according to the bible is the fire of the Holy Spirit. This fire ranges in size accordingly. Some have large fires, some small that are easily put out and some have sparks that are forming, but the pressures of this world and the stress of things comes to stomp it out. I also saw that there are some who consider themselves Christian- having grown up in the church and even regular church attenders who had a deep darkness – completely black -in their heart and cut off from the Lord. They have been fooled by religious rituals unto salvation. The darkness I saw in the heart terrified me. It was a deep darkness, like being lost and left alone in the deepest darkness. If we could only see the spiritual world surrounding us- I wonder if we would wake up? This darkness was ultimately created by the person’s sin, backsliding, turning from God… with gripping strongholds ( Spiritual Strongholds). And he thought he was saved, but didn’t realize the utter torment he was actually in. Remember the parable of the seed Jesus told us…. The seed that fell on the footpath represents those who hear the message about the Kingdom and don’t understand it. Then the evil one comes and snatches away the seed that was planted in their hearts. They hear the message, only to have Satan come at once and take it away. The devil takes it away from their hearts and prevents them from believing and being saved. The seed on the rocky soil represents those who hear the message and immediately receive it with joy. But since they don’t have deep roots, they don’t last long. They believe for a while, then they fall away when they face temptation. They fall away as soon as they have problems or are persecuted for believing God’s word. The seed that fell among the thorns represents those who hear God’s word, but all too quickly the message is crowded out by the worries of this life and the lure of wealth, so no fruit is produced. They hear God’s word, but all to quickly the message is crowded out by the worries of this life, the lure of wealth, the desire for other things, and the riches and pleasures of this life. The produce no fruit and they never grow to maturity. I heard the Word and loved what I heard, but I wanted to go my own way. I didn’t think I knew how to change this. I know it takes a changed heart only the Lord can change. It takes a willing heart. It takes a heart willing to give up the worldly desires and passions the world tries to tempt us with. It’s determination to say no to the things of this world and a new determination and desire to please the Lord. It is sad that I had to hit absolute rock bottom to change. But I rejoice in that time and my trials. It broke me where I needed to be broken and changed my life. In trials we have two choices- we can become bitter and angry or we can give it to the Lord and trust Him. The Dark Empty blackest heart: This person considered himself to be a practicing Christian, having grown up with rituals and practices for salvation, also attending church each Sunday. Yet demonic strongholds had him captive and although he heard the word, he listened and he tried, nothing changed. He couldn’t see the demon who had his hands wrapped around his neck. This demonic chokehold around the neck was choking out the word. 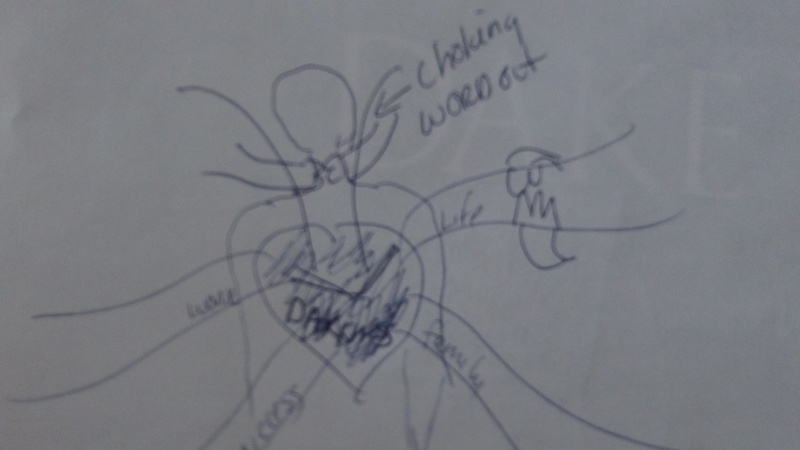 Let me explain further: This person heard the word of God , and I’m assuming this person wanted to change going to church each weekend, but as he heard the words and the words started to go down into his heart, the demonic hands wrapped around the neck gripped it so hard the word could not go into the heart. The heart stood unchanged, the man wrestled to no avail. I was given understanding to know that our battles in the day are really spiritual battles. We think they are people or situations, but they are not. To prove further: “we glory in tribulations also: knowing that tribulation worketh patience;4And patience, experience; and experience, hope Romans 5:3-4, you see the trials and tests we overcome strengthen us. In this heart I saw, I knew this person had faith and trust in the Lord and the trials endured through trust in the Lord had helped her now as trials still came. Although trials still came, the person stood unaffected by the storms. It reminds me of one of my favorite verses in Jeremiah 17:7-8 Blessed is the man that trusteth in the LORD, and whose hope the LORD is.For he shall be as a tree planted by the waters, and that spreadeth out her roots by the river, and shall not see when heat cometh, but her leaf shall be green; and shall not be careful in the year of drought, neither shall cease from yielding fruit. This verse tells us that those who trust in the Lord stand strong in their storms. If drought, extreme heat, or great storms topple over, the tree still stands tall and strong with it’s roots deeply secured along the river. It never worries and always keeps on producing fruit. I was reading the story of Moses and I thought it was really interesting that the Lord spoke to them from the heart of the fire. I wonder – if we are also made in his image spiritually. I saw that within us is a fire in the heart. It makes sense, but it never something I’ve considered or been taught. Deuteronomy 4:12 And the LORD spoke to you from the heart of the fire. You heard the sound of his words but didn’t see his form; there was only a voice. Deuteronomy 4:15 “But be very careful! You did not see the LORD’s form on the day he spoke to you from the heart of the fire at Mount Sinai. Deuteronomy 5:4At the mountain the LORD spoke to you face to face from the heart of the fire. Deuteronomy 5:22“The LORD spoke these words to all of you assembled there at the foot of the mountain. He spoke with a loud voice from the heart of the fire, surrounded by clouds and deep darkness. This was all he said at that time, and he wrote his words on two stone tablets and gave them to me. Deuteronomy 5:24They said, ‘Look, the LORD our God has shown us his glory and greatness, and we have heard his voice from the heart of the fire. Today we have seen that God can speak to us humans, and yet we live. There will be weeping and gnashing of teeth on that great and terrible day. I was thinking on this verse about a month or two ago and the Holy Spirit spoke clearly into my heart – those who will be weeping and gnashing their teeth will be those who think they are saved, those who have been lied to from the pulpit and those who consider themselves Christian. We cannot make our own rules and we cannot change the Laws and regulations of God to fit our lifestyle. We need to stop pretending and trying to impress people. Jeremiah 2:13 “For my people have done two evil things: They have abandoned me— the fountain of living water. And they have dug for themselves cracked cisterns that can hold no water at all! This verse says a lot in the few words it speaks- can a cracked cistern hold water? Can the heart of those who turn and abandon the Lord hold the living water? Be careful and above all guard you heart for out of it flow the issues of life. 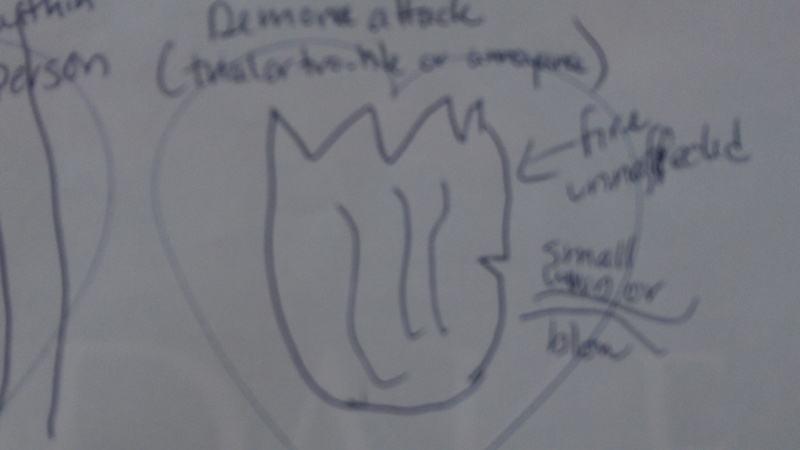 How can I enlarge the fire of the Holy Spirit in my heart? By enduring all your trials as you cling to the Lord -Raise your hands and Praise His name-know who your enemy is and know your weapons of warfare. Use scripture to lift you up if you are down. Fan into flames the fire of the Holy Spirit in you. Peace to All! May God’s grace and Mercy be upon you. The Lord is soo Good! He answered three specific prayers I prayed unto Him this week! Surely the Lord is good and His Mercy endures forever! I am so happy happy that He hears me and answers our prayers. Glory to you O Lord!